Flexi-fabulous fashion is all yours. 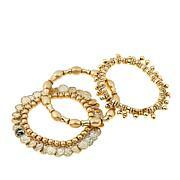 Just nab R.J's comfy stretch bangle trio. 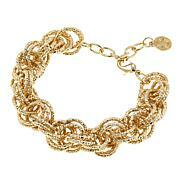 Wear one bracelet for an easygoing look. 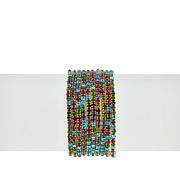 Pile on two or more bracelets for a feeling that's more dramatic. 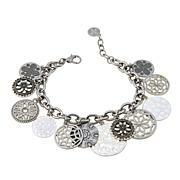 Mix and match with other bracelets to create styles uniquely "you." I LOVE THE FACT THAT THEY ARE ALL DIFFERENT AND THEY STRETCH. I ordered the large set. My wrists are just under an 8". These fit but with very little room for extra stretch to put them on and off. But love the love of all three of these. When on your wrist, they look like they should cost so much more. This was so cute and I loved it. The only problem was two of the bracelets broke the second time I Wore the set. I have many RJ pieces and they are of great quality. This one needed better elastic reinforcement. Cannot believe RJ Graziano would have his name associated with such inferior junk jewelry. This jewelry should be sold in one of those $10 and Under stores. 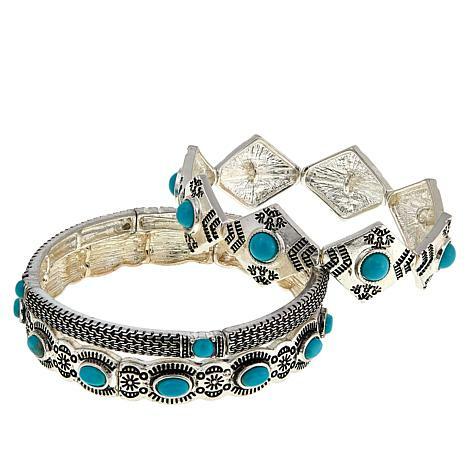 It's cheaply made, doesn't resemble turquoise whatsoever, doesn't sit upright on the wrist and was very small for medium/large--could barely get it over my hand. Won't even mention the outrageous price...so disappointed.